Jason Herbison is such a long term fan of Neighbours that he once wrote to Grundys to give them some ideas for the show. Story Editor Ray Kolle was so impressed he got in touch. “He said ‘We’ve got your letter. We do realise you’re in school but thought you had some really interesting ideas and we think you’ve got some talent! So stay in touch with us and maybe one day we’ll give you a job’ and they did. That was 24 years ago,” he tells TV Tonight. Today Herbison is Executive Producer on the show. Such dreams, it seems really do come true in the land of television. But with great ambitions comes great responsibility, especially on a show that is churning out 6 episodes of TV a week. “I drive in every Monday morning going ‘How can I do this? How can I use the time, the money, the resources to make the best possible show? What can I do differently that I didn’t do last week?’ I have found, after 3 ½ years, that’s constantly evolving. This year, for example, we are going to be doing a lot more off-site location shooting. We’ll be dealing with guerilla units, small groups. Since becoming EP in 2013, Herbison has overseen the 30th Anniversary and applying his own stamp to the characters and storylines, including nods to the show’s vast history. “The show was very fragmented with all sorts of odd combinations of people living in the houses that were hangovers from one person from a family that had since moved on or a cousin that had come in that had come in that no longer had anything to do with anyone. So I think my stamp has been to take it back to families, more believable household set-ups, and a cross-section of ages and characters,” he explains. Neighbours still airs twice-daily in the UK on Five, and in Australia on ELEVEN, and in the ever-evolving landscape of TV, one of Herbison’s challenges is understanding how ratings are impacted by storylines, multiplatforms and even competition from new players. “There are three really important broadcasts. There’s ELEVEN at 6:30. There’s the 1:45 UK and the 5:30 UK. The 1:45 UK having the highest ratings in five years. We know that our show is performing really solidly in the UK. We’re not sure why it’s not here but we’re taking a real look at it,” he says. Ratings on multichannel ELEVEN have been hovering around the low 200,000s for the soap. With the UK now fast-tracking the show the Neighbours universe is compacting, making life easier for writing and production. “We have a very close relationship, both with ELEVEN and Channel 5. They’re very involved in the show and all aspects of the show. They sometimes have different requests of us. “(We used to have to) plot two cliffhangers because the UK would be going off at the end of the cliffhangers and we have to be very careful,” says Herbison. And what of classification changes now that the show can lift from G to PG -will it impact on storylines at all? “I think our broadcaster will still want us to stay in the world of ‘G’ but we haven’t actually had the time to talk about that. With episodes already underway for 2016, Herbison outlines some of what viewers can expect to see in coming weeks, beginning with Paul Robinson (Stefan Dennis). “He’s a very important historic character for the show, very well loved. Love to hate. He loses all his money, so we see 2016 as a year very much about, ‘What does Paul Robinson do when he’s got nothing?’ How does that change his relationship with his children, his friends, colleagues? He has a very clear agenda throughout the year to get his money back and he’ll go in to business with an unlikely person and we’re going to see a very big year with Paul and his objective to reclaim his empire,” he explains. “Karl and Susan are going to have a very crowded house (this) year. Their grandson Ben, will be returning as part of the regular cast. They’ve also got Nate. They’re also going to get an unexpected new house guest later in the year that has a connection to someone in the past that’s going to really challenge them. So we will see a very good year for them. Janet Andrewartha will also be returning as Lyn Scully in 2016, which brings us to the question of whom Herbison would like to see brought back if he could wave his magic wand…..? “I think Natalie Imbruglia as Beth would be interesting given that we have Brad and Lauren in the show. For story reasons, she would be a character that would be very intriguing to see. “I used to always say Madge, but then we got her back,” he smiles. “Charlene, of course is Daniel’s mom. She would be very interesting. Scott would be very interesting. I have watched Neighbours since the 80s and agree with many who’ve commented. Neighbours should return to 10, however The Project is such a mainstay now, and there’s no real alternative. FF is successfully crossing all 3 channels and I believe the same treatment would benefit Neighbours. I’m have watched Neighbours for a long time now, and want to see it succeed, and it’s good to see an increase in the show’s UK viewership. However, the question must be asked as to whether it deserves an increase to its ratings on Eleven? Based on what has been presented on screen in the past 12 months, and what Jason Herbison has said in this interview, I’m going to go with ‘No’. What has happened to the 7am replay on TEN (or more like 6:57am)? It hasn’t returned for 2016. This seemed like the perfect slot for a replay, teens could watch it over breakfast before heading off to school (rather than the kids programs on 11 or elsewhere), and it seemed like a good pairing with Bold at 7:30am. Do people really jump out of bed just for Ben’s Menu? I’ve been watching Neighbours for around 25 years. I didn’t watch it at the start but I just recall being in school and someone was wearing a shirt that said Neighbours and had some of the characters names on it so I thought I’d check the show out. Been watching it ever since. Only thing these days is I don’t watch it as it airs. I used to watch it on 10 play or the encore screenings but now I just watch it on the pvr. The reason for this is The Project is on at the same time. Have watched that since it started and it used to be on after Neighbours, whilst now they put it on at the same time. So I watch The Project as it is live and watch Neighbours later. I don’t have a ratings box though so I hardly matter. That and I think a lot of people stick to the main channels and not so much the extra digital ones outside of watching kids cartoons on the abc channels. That’s a very good point john. Although I’m comfortable with it on eleven, I think as many have said, if they brought it back to ten their ratings would be higher for the mere fact a lot of people stick to the main channels. Speaking of Neighbours. Is there any logic to Eleven’s decision to slot Neighbours catch-up episodes at 2.00am to 4.30am on Sunday mornings?? Not really a timeslot that sticks out as being too helpful in terms of boosting the show’s reach. Saturday afternoon sort of makes sense. Sunday morning at 2.00am does not… although I guess it’s some alternative to infomercials, and music clips on Rage! If they are playing catch-up episodes during the daytime maybe they are just using the 2am slot ones as filler? Weirdos/insomniacs like me who are watching TV at those hours tend to watch whatever is on so maybe it will reach some of us! So I guess it doesn’t hurt any to replay it – although I hope that it’s the same episodes they are already playing during the day because otherwise you are correct, it doesn’t really help in the aid to draw in new viewers. Ratings are one thing, but Ten/Eleven must already know how many people watch via tenplay. Has this increased I wonder? I sometimes watch the show this way, but my usual viewing is either live or recorded on the PVR. Once the real world catch up TV watching is added into the oztam viewing numbers I suspect the ratings may improve a bit. I’ve always felt that ratings are a bit of a farce anyway, since it’s really only the viewing habits of a few thousand people that get selected to participate. if Neighbours aired in the morning and didnt have export deals with UK channels it would not have made it to 30 years. Video Hits deserved to make it to 25 or 30 years and because if produced correctly would have been cheeper than Neighbours would have outlasted it. The show hasnt really changed at all the stories are the same i think this show has had it. Its only a vehicle for upcomming actresses and actors but thats pretty much it. We got Madge back? Um no you didn’t. If you did you would have written her back into show. I love Madge and I don’t care if the character had to go into hiding and was on the run from the Mafia because she stole their jewels. Whatever. Just write her back in. Wash her up on the same beach as Harold was swept away from or washed up on? Legacy character. I love Madge. They got Madge back as a ghost. They can’t bring her back properly like Harold, as when he first left he disappeared whilst Madge died in a bed. Neighbours i feel is still stuck in the 90s and hasn’t truly adapted its itself to the present day. Other soaps like Home and Away and 800 words seem more edgier with their stories and more in touch with everyday life not too mention the scenic locations. neighbours was more modern 2007-2009 and used a lot of modern tech etc, the producer as got the characters and storys a bit more exiting but its the sets and look that needs improving – just cannot understand spending the money on the backlots yet get them wrong. the interior needs improving as well which wouldnt cost a lot just painting and new sofas would be a small improvement. I think neighbours is great, way better acting and scripting than H&A. FF at 6pm neighbours at 630pm and the project at 7pm on ten may give it the boost it needs. And more advertising! Thanks for the neighbours story, if you were new to the country and read TV Week you would think Home and Away was the only Australian show on TV. I hope the ratings improve, but if showing all eps on the weekend doesn’t help the ratings can they put other shows on instead. I really hope they are able to get higher ratings, I would hate for it to ever get cancelled, it’s such a good training ground for young actors and employs so many people in an industry where there aren’t enough jobs to go around. Surely having Neighbours and The Project on at the same time has always been an issue. Aren’t they targeting the same type of people?? Does The Project perform well at the expense of Neighbours? I’m glad they are scoping more off-site location shooting, as it’s becoming increasingly obvious that they are stuck on the backlot filming outside the studio building, which is making Erinsborough look more like an industrial suburb. They need to overhaul the house sets, number 24 hasn’t changed since 2005 except the purple paint, number 32’s previous kitchen was much nicer and has lost a lounge room, Toadies house is just god awful, and along with others halved in size for no reason at all, they are filming in the same studios, so space can’t be an issue as they have no additional permanent sets. Time to enlarge the sets and have the characters move around the house. It’s great seeing more promotion on Ten\Eleven over summer, but perhaps a 10.30pm replay is in order as well as a 4pm rerun on Eleven the following weekday. Nice to know that the guy running the show is a long term fan. I’m very envious of his luck. I must say the Christmas episodes were done realy badly, it just didn’t feel like a real Christmas. They had banks open and Toadie was booked into hospital on the day after Christmas. I doubt that would have been the case in real life. If they are going to do Chrsitmas episodes, they need to make them special and pause with the family a moment, like they do on some US Soaps. I remeber in the 80s Neighbours had that faboulous dream sequence at the end of the episode where they were all in Chrsitmas gear and that is how it ended. They didn’t do tragic end of season cliffhangers back then, as Neighbours was an alternative to other shows at the time that did (Sons & Daughters, Dallas, Dynasty). They did actually have family gatherings at Christmas but you’re right. The businesses open at Christmas and elective surgery performed on Boxing Day didn’t ting true. Perhaps they need to flash forward for their cliffhager episode and set it in the future for when they return in January. Or give them a happy ending for the end of the year. Cliffhangers command a bigger audience. Thanks for another Neighbours story and pics. It’s hard to get this info anywhere else in Australia these days. Of course it ratings would double on Ten, but that’s still only 400k and a loss of a lot of the FF audience. Neighbours is a Channel 5 show these days. When it moved to Eleven the money they paid was much less than Ten used to, hence all the shooting on small limited sets. I don’t agree with you npstanley80. 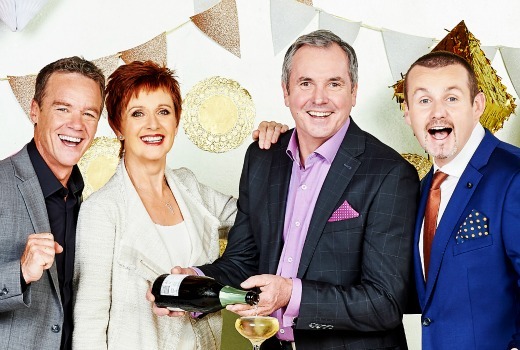 If Neighbours moved from 11 to 10 at a timeslot at 6:30pm, then it will tank. Leave it on 11.